Every Thursday we’re presenting a blast from the past, a ‘throwback Thursday’ edition to celebrate, honor, and remember CARP’s rich 50-year history. Check out our Facebook page ‘CARP Life’ for more updates! If you have a story or testimony with CARP, share it here! Here is a page from “An Introduction to one of America’s most Significant Collegiate Organizations,” that summarizes CARP’s programs and purpose. Renowned CARP lecturer, Beverly Berndt, is pictured on the bottom left sharing about the Parallels of History and the significance of the time we’re living in. Akiko Ikeno takes the mic at the Pure Love Alliance Benefit March in Washington, D.C. on November 28, 1997. Thousands of young people attended the event which promoted purity and family values. 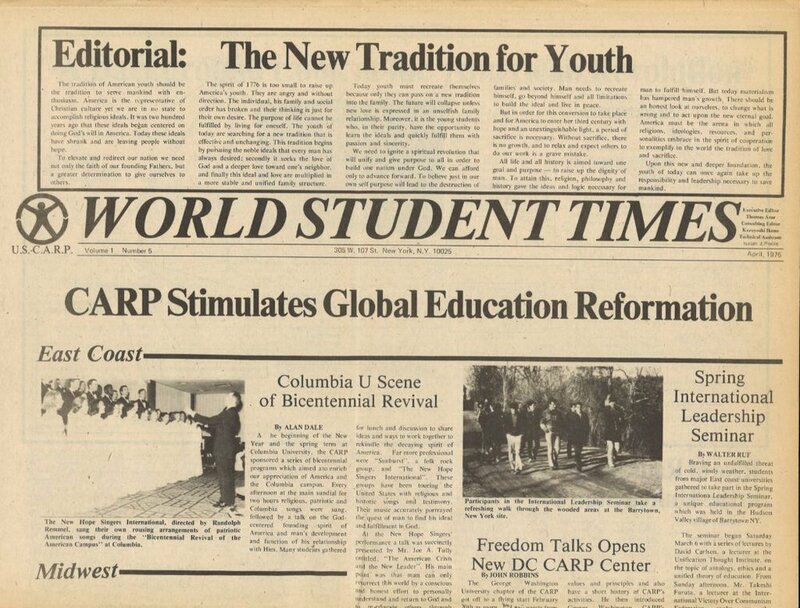 Upon reviewing archives, we found a copy of the CARP “World Student Times” from April 1976. The editorial at the top, “The New Tradition for Youth” is transcribed here. Here’s a flyer from the first CARP chapter in the United States, Columbia CARP! We found this gem in our archives and we think it’s from the late 1970’s. It’s refreshing to see we’re still teaching about how Unification Principles develops us as people who care for others. Our Elder Brother Hyo Jin Nim delivering his passionate speech at the Berlin Wall Oktober 1986 telling the CARP members and all the people gathered that there is room for everybody in God’s Heart. CARP speaks out publicly against communism at the White House 1983. National Director of CARP, Joon Ho Seuk delivers his message during the “Unificationism and the Martial Arts” tour in 1983. After a successful event, Henri Schauffler, Mike Smith, Dan Fefferman, Tiger Park, and Joon Hyun Park lead a victory cheer. Newer Post2 Days ‘Til CARP America Goes to Japan!